The Lancia Stratos HF is a rally car produced by the Italian brand Lancia, of which only 492 units were built to compete in the World Rally Championship. 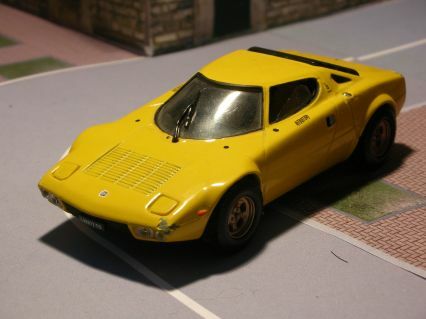 The body was designed by Bertone based on a prototype of the Turin Motor Show in 1971. Noted for its wedge-shaped, its short length and great width, which gave more traction. The front windscreen crescent provided a great forward visibility, though the rear was nil (unnecessary in a rally). It uses a mid-engine V6 2418 cc and 190 hp (140 kW) which was the same as riding the Ferrari Dino. For competition was raised to 280 hp and even 480 hp turbocharged (turbo is allowed only in Group 5). The Stratos succeeded in rallying in the 1970s and 1980s, and was specially designed for this competition an won the World Rally Championship in 1974, 1975, 1976, into the hands of Sandro Munari.